A pagan chieftain from the neighborhood of Kildare was dying. Christians in his household sent for Brigit to talk to him about Christ. When she arrived, the chieftain was raving. As it was impossible to instruct this delirious man, hopes for his conversion seemed doubtful. Brigit sat down at his bedside and began consoling him. As was customary, the dirt floor was strewn with rushes both for warmth and cleanliness. Brigit stooped down and started to weave them into a cross, fastening the points together. The sick man asked what she was doing. She began to explain the cross, and as she talked, his delirium quieted and he questioned her with growing interest. Through the weaving, he converted and was baptized at the point of death. Since then, the cross of rushes has existed in Ireland. 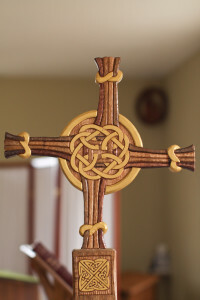 Attendees at the Celtic Fest will have an opportunity to make their own St. Brigit's Crosses. Many people hang them over their doors to protect their homes.